The recipes and text of this ‘Summer’ book have brought back wonderful memories of the languorous Sunday lunches we used to spend together, enjoying good food, wine and fun with our large, extended family of friends. Lunches that often drifted into dinner, with everyone contributing something to the table. Those days may be now distant memories, but the taste of those meals is long savored. This book is clearly set out and beautifully illustrated. The photographs are warm and stimulating. The text has clear timing principals and instructive tips on perfecting dishes. Even more elaborate ones, such as the Summer Terrine are explained in easy steps, making each succulent layer clear and concise. 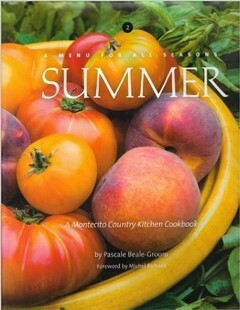 From the pleasures of Provence in the guise of the Beignets de Courgettes et d’Aubergines to a taste of the Pacific in the succulent shape of the Cured Salmon with Mesclun Salad, and all the dishes in between; redolent of this hot, vibrant season, this book is the perfect summer feast. • Eight three-course menus featuring 42 recipes and full color photographs.